Smartphone owners who fancy Google's mobile operating don't have to shell out any cash for excellent apps. When talk turns to mobile app stores, Apple's iTunes App Store is often the focus of conversation—but that may be quickly changing. ABI Research reported that Google's Android Market overtook Apple's in Q2 2011, becoming the marketshare leader in mobile app downloads with a 44 percent share, versus Apple's 31 percent. If you're an Android smartphone owner, that should come as no surprise. Not only does the Android operating system power a wide array of handsets from HTC to Samsung (Apple, as always, has its OS tied exclusively to its own hardware), but there are many excellent apps that expand your cell phone's out-of-the-box functionality. And many of the best Android apps are free Android apps. That's right, you don't have to spend a dime in order to soup up your Android phone. The free Android apps that you'll find in this 40-app deep roundup offer a mix of entertainment (Slacker), productivity (Evernote), and games (Angry Birds) software that will turn your smartphone into an all-in-one wonder device. The free apps that were selected were chosen because they are stable, useful, and add extra functionality. Are you ready to check out the best free Android apps? Long-time Android users will find a solid mix of some oldie but goodies, as well as relatively new apps. 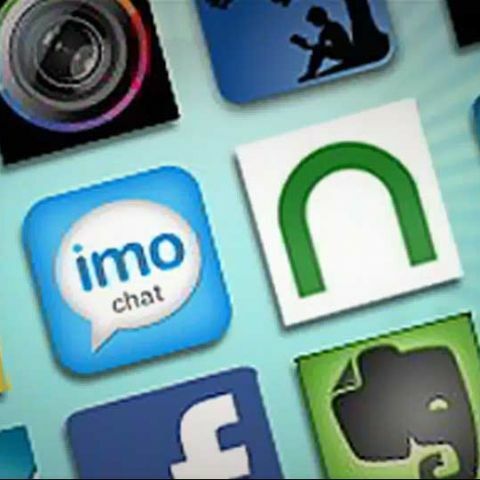 Our slideshow details 40 best Android apps that you'll find in the Android Market. If you have free Android app recommendations of your own, sound off in the comment. Dolphin Browser HD 5 is a multi-faceted mobile Web browser. You can change the app's look and feel through custom themes, add new features with Add-ons, or even navigate using gestures. The latest version adds Featured Webzine Columns, redesigned launch pages, a refined user interface, and the ability to sync bookmarks across all of your Dolphin Browser installs. WordPress is one of the most popular blogging platforms, boasting over 25 million software downloads and 15,000 plug-ins. If you wish to blog while away from your computer, this WordPress app will let you do just that, but on your Android phone. Bloggers can quickly create drafts, edit posts, and approve comments without the need for a Mac or PC. If you're anything like me, you've "lost" your phone many times only to find it tucked away in a jacket pocket or some other obvious—or not so obvious—locations. Now you can save yourself plenty of worry with Wheres My Droid [sic], which forces your phone to ring at maximum volume or vibrate when the phone receives a text message containing a specified phrase, such as "Where's my Droid?" The app can also tell you the phone's location, as long as its GPS is enabled. Stuck on a word's definition? The add-supported Dictionary.com app is a great tool for quickly looking up word meanings. Best of all, the dictionary and definitions live on your phone; no need to connect to the Web to pull down the information that you seek. Google Maps is a potent tool for any Android smartphone owner who needs location information. A few of its signature features, such as navigation and layers, work better on Android than most other mobile operating systems. It's indispensible for finding addresses, service providers nearby, and basic navigation. Google Translate can translate text in more than 50 languages. Most impressive of all, you can even use the phone's microphone to pick up spoken dialogue and have it translated into another language. It's a remarkable thing, even when it's not 100 percent perfect (as machine translations are a long way from being flawless). One of the handiest reference websites on the planet, IMDb never fails when it comes to looking up anything that has to do with TV, film, or Hollywood. The app also lets you find which movies are playing at your local cinema, and even purchase tickets. With an IMDb account (free or paid for Pro), the app provides even more features, like the ability to create a watchlist of movies you want to see. If you hear a song and don't know what it is (or for the life of you, can't remember who sings it)—Shazam to the rescue! Fire up Shazam on your smartphone and hold it as close as you can to the speakers. Within a few seconds, the app will tell you the title, artist, and sometimes even find the album art, too. Shazam is a whiz with most radio-play songs, new and old, originals and covers, but it occasionally gets stumped by obscure b-sides. WebMD is much more than a diagnosis app, although you certainly can use it to input symptoms you are experiencing and find some clues as to what's ailing you. It also contains listings for healthcare professionals and pharmacies in your area, as well as first-aid guides—simple instructions for dealing with an emergency that everyone should have accessible at any time. This free reference app is one you hope you don't need, but, the moment you do, you'll be glad you downloaded it. Smartphone are called "smart" because they enable you to keep a hefty amount of information in the palm of your hand. Wikidroid is a prime example of this; the app pulls articles from Wikipedia and optimizes their display for easy reading and searching from your mobile phone. The app has elegant search functionality, too. Android users gravitate to Astrid because it's the best list maker and task manager there is for Android phones. It has all the features every list-maker needs, including due dates and alarms, and it syncs with Google Tasks (it doesn't synch with Remember the Milk, although it used to). Catch is a cloud-based service that lets you save notes of all kinds—audio memos, typed notes, and photos. If you think it sounds like Evernote (see below), you're right. It's similar to that app, and well customized for Android phones. If Evernote isn't quite your speed, but you're looking for something similar, give Catch a try. Nearly everyone works and plays on multiple computers, which means that you have files scattered across numerous machines. Dropbox comes to the rescue with a service that lets you keep files in sync across multiple computers simply by moving them into the Dropbox folder. The Dropbox Android app lets you access those files—and sync new ones—on your Google-powered smartphone. If you weren't an early adopter of Evernote, the freemium note-taking and organization app that syncs all your files to a cloud service, there's no shame in being a late adopter of this outstanding service. On an Android phone, Evernote works smoothly, looks great, and most importantly, integrates with dozens of other apps and services. The app automates synchronization, a fail-safe measure in case you forget to put your files back in the cloud when you're done working on them. The website and service Mint.com helps you keep detailed account of your finances by connecting to your bank and credit card accounts and tracking all the money you earn and spend. The Android app extends the experience so users can keep an eye on their spending better while on the go. Just enter a few data points as you spend, and you'll be able to see your spending patterns as an easy-to-read chart. Social networks thrive with a reliable app, and Facebook's for Android is solid. The Android app has the quintessential Facebook-branded interface but some unique functionality that's absent in Facebook's iPhone app, such as a side-scrolling preview pane of recently shared photos in the dashboard area. Love it or hate it, no respectable app store is complete without Foursquare, the popular social networking application that lets you check you into locations. You can easily tell your friends where you are, share photos, and view comments. Plus, many businesses offer discounts and freebies to foursquare users, so you may save cash while checking in. Gmail, Google's e-mail application, comes to Android devices as a dedicated app. With it, Gmail users can star, label, search, and access synched messages when offline. It also supports multiple Gmail account, so you can check messages from all your accounts on one device without signing out. Social networks need mobile apps to thrive, and Google 's is a fine start for the platform that arrived in July 2011. The app taps into conventions established by other online social networks, like Facebook and Twitter, while finding some of its own strengths at the same time. Google Mobile works fairly well, due to a smart design and comprehensible interface. With voicemail, text messaging, and other great features, Google Voice is an excellent service that is a welcome addition to Android phones. Use it whenever your traditional phone carrier would otherwise charge you big bucks—such as when placing pricey international phone calls. Multi-purpose instant message apps can falter on mobile phones, crashing frequently or draining the phone's battery. While it's not perfect, IMO Instant Messenger is by far one of the lesser offenders. Another reason it's better than some others is it supports instant messaging across an impressive 11 networks (both popular and relatively obscure) including MSN, Yahoo!, AIM/ICQ, Google Talk, Myspace, Skype, Facebook, Jabber, imo, VKontakte, and Hyves. Stable and reliable video chat apps for Android aren't easy to come by, but ooVoo is terrific. The Android video chat app supports group video, voice calls, and instant messaging—across iOS, OSX, Android, and Windows. Not only do you get solid Android video calling, but you can practically video chat with anyone. To be perfectly clear, I don't think Skype is "the best" communication app for Android, but it's one of those tools that I will continue to use because other people use it, too, and so it's often the quickest way to get in touch with certain people. In short, the Skype app is one that I rely on, even though it has some functional limitations (namely, no support for front-facing cameras, as well as taxing the battery pretty severely). Plenty of third-party Twitter apps and social media aggregators have graced the Android Marketplace, some with pretty terrible performance track records, but the one that works best is Twitter's own. Starting with version 2.1.2, Twitter for Android adds support for multiple accounts as well as optional push notifications (alerts that appear on your phone similar to an alarm or incoming text message), two features that had been sorely lacking prior to this release. A clean user experience and smart design doesn't hurt either. Best of all, if you don't have a Twitter account and aren't interested in joining, you can still use the app to search and read the site. Movies, by Flixster (some people know the app better by the developer's name), puts theater times, release dates for movies and DVDs, film reviews, and trailers in the palm of your hand. If, for example, you need to know the exact date that A Very Harold & Kumar Christmas will be hitting theaters, Movies can confirm the November 4, 2011 release. By default, the app pulls movie ratings from Rotten Tomatoes, although you can override this feature if perhaps you don't think The 400 Blows deserves a 100 percent critics' approval rating. You'd be wrong, but you can do it. When we in the PCMag lab talk about music streaming services, Editors' Choice Slacker Radio always gets an extra nod. It serves up excellent audio quality, a well-designed interface, tight lyrics implementation, and load of customization options. Slacker doesn't have niche stations or deep social networking features, but it's still the music streaming service to beat. As an unapologetic TED evangelist, I have to recommend some kind of TED app for Android, and TEDAir is the one to beat currently. It runs a little faster and smoother than the TED-branded app. If you're unfamiliar with the TED Conference, its tagline is "Ideas worth spreading," and that's most of what you need to know. The TED app brings you video-recorded presentations from those conferences, which are uplifting, education, inspiring, and sometimes jaw-dropping. First-time listeners and watchers should give Jill Bolte Taylor's stroke of insight presentation a try. For those of us who prefer live radio to podcasts, TuneIn Radio is worth a download. You can listen to over 50,000 local and global radio channels such as BBC, NPR, and SWR. Purchasing the $0.99 TuneIn Radio Pro adds the ability to record audio. You can't have mobile devices without Angry Birds. The causal game juggernaut that just keeps rolling, challenges you to destroy structures (inhabited by villainous swine) by flinging crotchety little birds at it using a giant slingshot. The franchise has dozens of titles, like Angry Birds Rio and Angry Birds Seasonal, but the original Angry Birds is the one to download to your Android phone first. The follow-up to the award-wining action-strategy game Guns 'n' Glory Wild West puts you in the role of a military commander (either the Allies or Axis) during The War. You mission? Guide your troops, tanks, and warbirds to World War II victory. A RPG-like skill and leveling up system lets you power up your squad to achieve an advantage over the enemy. In the mood for a light diversion that contains a hefty dose of retro goodness? Gurk, the 8-bit RPG features a three-character party system, two dozen dungeons, 23 monsters, and lots of action. The story is virtually non-existent, but if you're fans of old school bleeps and bloops, you'll find a lot to like here. Words with Friends, Zynga's take on popular board game Scrabble, is among the most popular (and addictive) mobile social game. If you own an Android phone but your friends are on other devices, such as iPhones or iPads, you can still challenge them to head-to-head wordplay. Some Android users have reported stability problems with the game, but Zynga has pushed out updates that should improve the apps overall performance. If your Android smartphone has a less-than-stellar camera, don't fret. FxCamera adds filters and effects, such as "ToyCam" and "Warhol," to enhance even the most modest photos. It also helps to arm yourself with some additional tips for getting better photos from your phone. In short, if you take snaps on your Android phone, consider this a must have app. GateGuru is an app to pack when it's travel time. It helps you navigate airport terminals, anticipate wait times, find the freshest airport food, and travel with greater confidence. It also has airport maps and checkpoint wait times. Plus, GateGuru integrates with Tripit and Kayak for flight details, as well as Gowalla, Foursquare, Twitter, and Facebook for sharing with friends. Google Goggles is an augmented reality experience that layers additional information from the digital world onto the physical world. For example, you can whip out your phone, take a snapshot of anything from a painting in a museum to a placard that's written in a language you don't understand, and Google Goggles will give you more clues to help you figure out what's in front of you, or why it's important. Some of the deals that crop up on Groupon are just too good to pass up, like 50 percent off that take-out place where you eat once a week anyway, or a $20 one-month gym membership. The Groupon Android app lets you not only snag deals, but cash them in, too, so you don't have to print any paper vouchers or coupons. Read books, magazines, and newspapers right on your Android phone without ever buying an e-reader. The Kindle app is by far the most popular reading app in the Android Marketplace because it gives you access to buy or download for free hundreds of thousands of books, and more than 100 different newspapers and magazines. And while some users have complained that they can't uninstall Kindle once they've downloaded the app, it is possible (but it takes a little effort). Anti-Amazon book lovers might prefer an app by Barnes & Noble for reading on their Android phones. Nook and Kindle largely do the same thing (give you access to an impressive library of books, newspapers, magazines, and other things to read), although their interfaces and experiences are different. Whether you like Amazon or B&N is largely a matter of personal preference. The Nook feels a little more graceful in its design, whereas the Kindle app looks more utilitarian. Consider Yelp the Yellow Pages for the apps generation. Yelp can help you find diners, computer repair shops, bars, and countless other businesses and services. Factor in social networking and user reviews, and you have an app that should find a home in every smartphone owners' handset. What are the best free iPhone apps for youngsters?